"A vicious cyborg abomination with life-stealing tentacles protruding from its chest during attack." 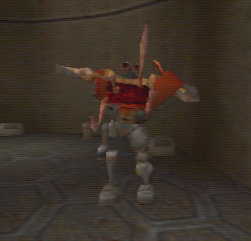 This is one of the weirdest-looking Stroggs out there, and really adds to the story of how the Strogg cyborgs are thrown together messes of flesh and steel. 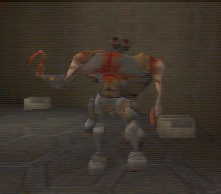 One look at the way he shuffles around and flails his arm/tentacles while attacking will show you what I mean. 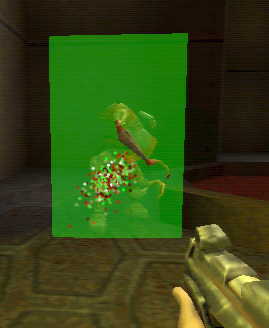 The brains doesn't have any long-range weapon, and is relatively slow, but is armed with a green-ish shield which absorbs the brunt of your attacks. If you are close enough, the shield won't be able to activate itself... but you'll be in range of all of his attacks. Typically he'll flail both his arms and hit you twice for 30-40 damage, and then open a compartment in his chest and whack you with some other tentacles which jump out at you. Hit-and-retreat is a good tactic to take him out, or if you have the ammo you can kill him right through the shield (a small amount of damage does get through). You always have to watch yourself when fighting him though, one mistake and you could lose half your health.